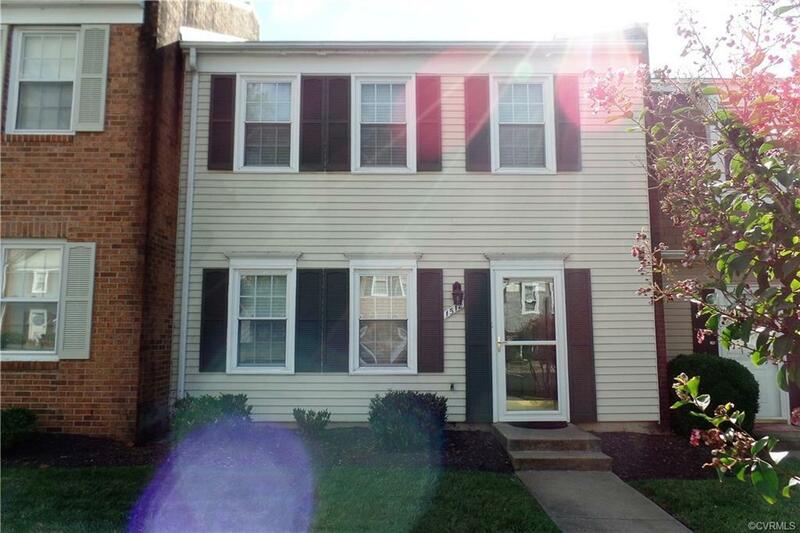 This lovely home has had many wonderful updates and is in move-in condition. Laminate floors line the foyer and extend along the downstairs hallway, into the kitchen and dining area. The living room boasts new carpet, a new ceiling fan, and an oversized doorway that leads to the dining area and kitchen. The dining area features a woodburning fireplace, which adds a bit of character to this welcoming space, and the kitchen offers new light fixtures, freshly painted cabinets, and new countertops. From the kitchen, you can venture onto the patio, which has recently been powerwashed and has a new gate. The half bathroom features newer decorative tile flooring and the sink vanity was replaced several years ago. The home also offers new carpeting along the stairs and entire second level. The full bathroom has newer tile flooring, the stylish sink vanity was replaced several years ago, and there is decorative tub tile surround. Each bedroom is highlighted by crown molding with decorative corner blocks. The home has been freshly painted throughout, the electrical system was updated several years ago, and the subflooring on the second level has been replaced. Owners of Lifelong Realty, Inc.